Petfinder Foundation Sponsor A Pet - Fundraise through Petfinder. The Petfinder Foundation Sponsor A Pet program is the easiest way to receive money through the Petfinder Foundation and allows visitors to Petfinder to donate to your organization through each of your pet’s profiles. Funds from this program can be used to support a particular pet in your care or to support the operational expenses of your organization. 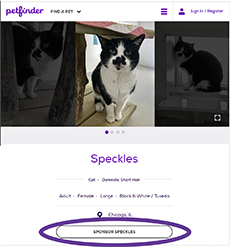 Each of your adoptable pets has a “Sponsor Me” button on his or her profile, simply sign up for the Sponsor A Pet program to start receiving donations sent through your pets’ profiles! Petfinder receives millions of visitors a month, many of whom are looking to support homeless pets. The Sponsor A Program program lets these individuals donate to you. Reach a new pool of potential online donors with virtually no additional effort. You’ll also receive your donors’ contact information so that you build long-term relationships. 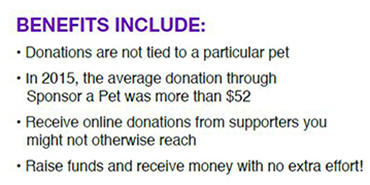 Not sure if your shelter or rescue group is participating in Sponsor A Pet? No problem! Email the Petfinder Foundation to inquire about your organization’s status. Visit the Sponsor A Pet FAQs for more information.